2. Do I Claim My 19-Year-Old on My Taxes? Dependents can help reduce your tax burden each year, allowing you to keep more of your take-home pay. In many cases, there’s a limit to how long you can claim your child, even if he lives at home well into adulthood. But you may be able to claim your adult child as a dependent, as long as you meet the IRS’s qualifications. You can claim an adult child as a dependent as long as that child meets all the IRS’s eligibility tests. Generally speaking, a child must be younger than you and either under 19 or, if she’s a student, under 24. The IRS goes by the age of your child at the end of the calendar year. Your child must also be a citizen or resident of the U.S. and must meet the IRS’s relationship rule. That rule states that the dependent has to be a relative, which means she’ll either need to be a child, stepchild or adopted child. Nieces and nephews also count as dependents, as well as qualifying relatives your own age or older who are dependent on you. You’ll see a major exception to the age rule if your child is permanently and totally disabled. To meet the IRS’s qualifications for this, your child cannot be able to engage in any substantial gainful activity due to the disability and the condition must have lasted at least one year. If the condition has recently been diagnosed, the doctor must have determined that the disease will last at least one year or lead to death. If the child is legally blind, it’s important to keep up with the IRS’s rules surrounding that, since there are increased standard deductions for those who are legally visually impaired. For 2018, unmarried, blind taxpayers will get an additional $1,600 on top of the standard deduction of $12,000 per person. At one time, one of the biggest incentives for claiming dependents was the personal exemption, which gave $4,050 for each taxpayer, spouse and dependent. This gave couples filing jointly a tax break, which served as a big incentive for claiming child dependents. The Tax Cuts and Jobs Act eliminated this exemption, while also increasing the standard deduction to $12,000 per taxpayer. The plan is to restore those exemptions in 2025, but until then, parents will need to look to other tax breaks, although they are largely geared toward parents of minor children. For parents of children under age 17, the child tax credit has doubled under the new tax law. This won’t help parents of adult children, though. Neither will the fact that more of the child tax credit is refundable. The new tax laws have left the education breaks for children intact, though, which is good news for parents of adult children who haven’t yet graduated. Anyone you claim as a dependent must rely on you and/or your spouse for at least half her support. The IRS’s test for this has previously relied on the personal exemption each taxpayer was given. But even though this exemption has been wiped off the map, you won’t be able to claim your high-earning daughter on your taxes. Interestingly, although previously the dependent couldn’t earn more than the personal exemption amount, that limit has been dropped to $0 for 2018. Experts have speculated as to whether that means dependents will no longer be allowed to make more than $0 to qualify. One rule still applies, however. If your child makes above a certain amount, he’ll be required to file a tax return of his own. As long as your child is under the age of 65 and not blind, he must file a tax return if he earns $6,350 or more. So, if your adult child moves back home at the age of 25 and takes even a part-time job, he’ll probably have to start filing his own tax return, which means it gets a little trickier to claim him as a dependent. However, it’s important to note that in previous years, when the exemption was in place, taxpayers could file taxes and check the box that someone else claimed them as a dependent. Without the exemption, parents may have less of an incentive to try to claim adult children as dependents when they’re making their own way. Another sticky situation when trying to determine who qualifies as a dependent is the residency factor. In order to qualify as a dependent, your child must live with you at least half the year. The only exception is if your child is under 24 and is a full-time student living near campus. 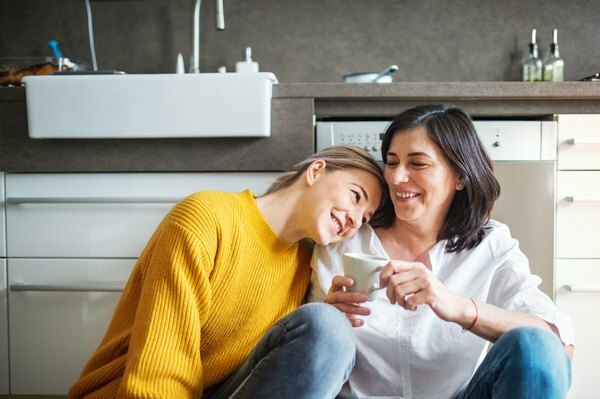 If your child is over 19, not a full-time student and moved into an apartment of her own at some point during the year, you’ll have to calculate the months she lived with you to ensure she meets the residency requirements. There are other exceptions to the residency requirement, including instances where an otherwise qualifying child dies or is kidnapped during the year. If this occurs, even if the child did not live with the parent for at least half the year before that happened, the IRS will allow the deduction as long as the child meets all of the other requirements. Children who are away for military service, institutionalized, on vacation, incarcerated or hospitalized due to illness will also meet the residency test if all other requirements are met. When claiming adults as dependents, the IRS uses a test called “qualifying relative.” This is how you can claim your child who is over the age of 24 and still lives with you. If that adult child is related to you, by the IRS’s definition, that child fits into the qualifying relative category. Also in that category would be a parent, grandparent, sibling, niece or nephew. As long as the relative meets the IRS’s other requirements, you can claim that person as a dependent. If that person is your adult child, he’ll simply need to meet the IRS’s other requirements. One thing that is notable about qualifying adult relatives is that they do not have to live with you. This means that although your under-19 child would need to live with you to qualify, your adult child would not. He could live in his own home, with a caretaker or with a significant other and still be claimed as a dependent on your taxes as long as he relied on you for more than half his support during the tax year. Although your adult child may not have to live in your home, she will be restricted in how she files her taxes, provided she makes enough to file. An adult dependent cannot file a joint return while also being claimed as a dependent on someone else’s taxes. This means if your adult child gets married and wants to file a joint return, you will have to stop claiming her. At that point, she’ll likely be ready to move off your tax return anyway. However, there are two exceptions to the joint return rule. If neither the adult child nor her spouse is required to file a tax return except to get a refund, they can file jointly and still have you claim her as a dependent. Another exception to the joint return rule is in instances where neither member of the couple would owe if they were to file separately instead of jointly. In both of these cases, you’d be cleared to claim her as a dependent as long as all the other requirements were met. In some instances, deciding who claims the adult child causes questions to arise. An adult child may move home with his parents, for instance, bringing a grandchild with him. In that instance, the family may be at odds as to whom should claim the grandchild as a dependent. In such cases, the family usually makes a decision together and proceeds without IRS intervention. However, if family members cannot decide, the IRS recommends the tiebreaker rule, which says the child is treated as a qualifying child first by his parents if they file a joint return. If that isn’t the case, the parent with whom the child lived the most during the year will claim the child as a dependent. If those don’t answer the question, the IRS goes by the parent with the highest adjusted gross income. One issue that comes into play when it comes to adult children is support. To qualify as your dependent, you must have provided more than half of your child's support during the year. Support includes the mortgage you pay, as well as the food, education, medical care, clothing, health insurance and recreation your child used throughout the year. For lodging, the IRS goes by the fair market value rental cost of your property, not your actual mortgage. It’s important to note that if your adult child receives Social Security benefits, this counts toward the child paying her own way. If you pay your child wages to work for you, it is also not considered support by the IRS and is considered earned income for the child instead. You’ll need to take all factors into account to ensure that you were responsible for more than half of that child’s support through the entire tax year to make sure it’s a valid deduction. Now that the tax laws have changed, claiming an adult child as a dependent is not as attractive as it once was. It’s important for taxpayers to analyze whether the deductions they’ve been claiming are still the best option. The new tax law did add a $500 credit to cover adult dependents who weren’t eligible for the tax credits that are geared toward children who are 17 and under. Unfortunately, though, there are questions as to how much a dependent can earn under the new tax laws. The tax laws technically state that the dependent cannot have income in excess of the personal exemption to qualify. Since the exemption has been taken down to $0, the question then becomes whether they can earn even $1 before disqualifying themselves from the $500 credit. However, this $500 could be attractive to parents of disabled adults who rely solely on their parents for their support. It will also help parents whose adult children are trying to get back on their feet after a life change when it seems to be taking longer than they thought it would. If they have a solid year of no income, the parents will at least get a small tax credit that they hopefully won’t qualify for once the new tax year begins and the child begins earning income. The College Investor: WHAT TO DO IF MY PARENTS CLAIMED ME ON THEIR TAXES?